As he is nearing the completion of the post production formalities for Manchu Manoj’s Attack, director Ram Gopal Varma is now gearing up to kick start the shoot of his multilingual film, Killing Veerappan. The film will be made simultaneously in Telugu, Tamil, Kannada and Hindi and the shooting has begun today. Killing Veerappan is a biopic based on the killing of the notorious sandalwood smuggler Veerappan. 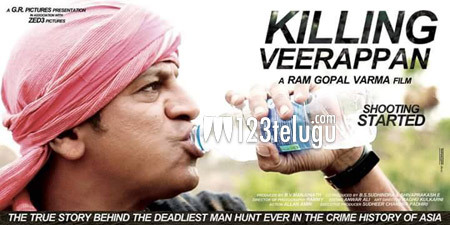 Kannada superstar Shivaraj Kumar will essay the role of a cop who killed Veerappan in a deadly encounter. Popular Kannada heroines Parul Yadav and Yagna Shetty will play the female leads in the film.